Source Reference: [PubMed ID: 8663447] Nascimento AA, Cheney RE, Tauhata SB, Larson RE, Mooseker MS, Enzymatic characterization and functional domain mapping of brain myosin-V. J Biol Chem. 1996 Jul 19;271(29):17561-9. [PubMed ID: 24302658] Kanno TY, Espreafico EM, Yan CY, Role of myosin Va in neuritogenesis of chick dorsal root ganglia nociceptive neurons. Cell Biol Int. 2014 Mar;38(3):388-94. doi: 10.1002/cbin.10210. Epub 2013 Dec 3. [PubMed ID: 20935627] ... Kodera N, Yamamoto D, Ishikawa R, Ando T, Video imaging of walking myosin V by high-speed atomic force microscopy. Nature. 2010 Nov 4;468(7320):72-6. doi: 10.1038/nature09450. Epub 2010 Oct 10. [PubMed ID: 14992598] ... Yengo CM, Sweeney HL, Functional role of loop 2 in myosin V. Biochemistry. 2004 Mar 9;43(9):2605-12. [PubMed ID: 14565972] ... Cao TT, Chang W, Masters SE, Mooseker MS, Myosin-Va binds to and mechanochemically couples microtubules to actin filaments. Mol Biol Cell. 2004 Jan;15(1):151-61. Epub 2003 Oct 17. [PubMed ID: 10519557] ... Wells AL, Lin AW, Chen LQ, Safer D, Cain SM, Hasson T, Carragher BO, Milligan RA, Sweeney HL, Myosin VI is an actin-based motor that moves backwards. Nature. 1999 Sep 30;401(6752):505-8. [PubMed ID: 1469047] ... Espreafico EM, Cheney RE, Matteoli M, Nascimento AA, De Camilli PV, Larson RE, Mooseker MS, Primary structure and cellular localization of chicken brain myosin-V (p190), an unconventional myosin with calmodulin light chains. J Cell Biol. 1992 Dec;119(6):1541-57. [PubMed ID: 1383040] ... Sanders G, Lichte B, Meyer HE, Kilimann MW, cDNA encoding the chicken ortholog of the mouse dilute gene product. 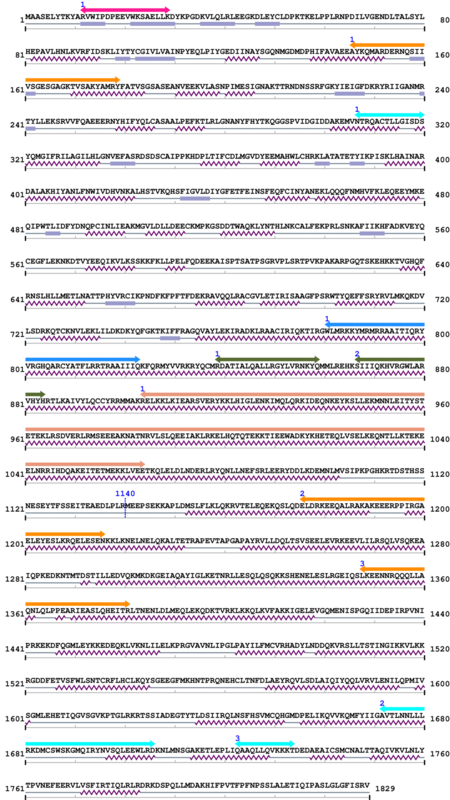 Sequence comparison reveals a myosin I subfamily with conserved C-terminal domains. FEBS Lett. 1992 Oct 26;311(3):295-8.